Includes local wines, spirits and soft drinks! Hugely romantic ambience - think lamplit walkways at night, billowing mosquito nets, dinners by candlelight on your private deck - makes this a fantastic couple's retreat! 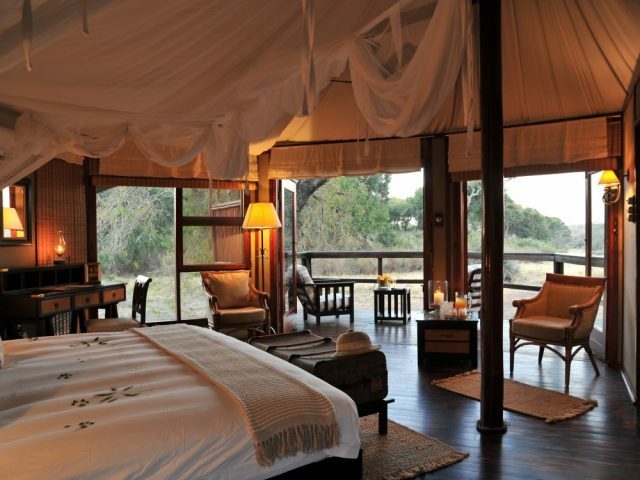 Both in the tented suites as well as the lounge area, Rhino Sands simply oozes traditional safari style! The aim was to re-create the romance of going on safari in East Africa back in the early years of last century and they've succeeded in spectacular fashion! 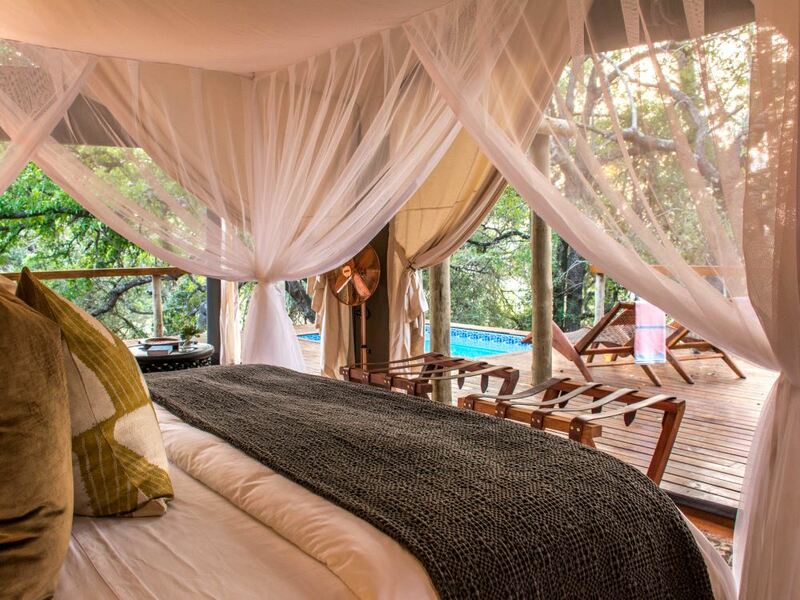 whilst Rhino Sands oozes traditional safari style, it’s also successfully embraced some bang-up-to-date modern features like private plunge pools on each tent’s spacious deck as well as stunning outdoor showers! 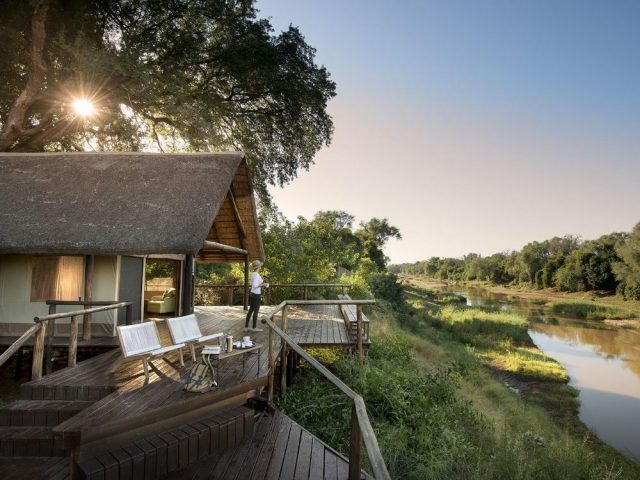 Here at Bushscapes we make no secret of the fact that we LOVE tented camps – for an absolute cracker, look no further than this stylish and intimate new lodge consisting of just 4 luxurious tented suites in Zululand’s Manyoni Reserve! The idea behind Rhino Sands was to re-create the stylish nostalgia and romance of going on safari in East Africa back in the early years of the last century. Located in the shade of the riverine forest along the banks of the Mzunduze river in the Manyoni Reserve, the whole of the camp – from the rooms to the charming public areas and even the kitchens – is all under canvas and decorated in traditional safari style including some gorgeous antiques. Yet whilst Rhino Sands oozes traditional safari style, it’s also successfully embraced some bang-up-to-date modern features like private plunge pools on each tent’s spacious deck as well as stunning outdoor showers! Let’s be clear about 1 thing here right away: when we refer to the “tents” at Rhino Sands, banish any thoughts of the simple, cramped and uncomfortably flimsy affairs you may have suffered on camping trips in your youth; instead you’ll be delighted to find yourself in some of the most stylish, spacious and luxurious game lodge accommodation you could possibly imagine! We particularly loved the way that you can open up the tents on 3 sides, giving you virtually unobstructed views out onto the surrounding riverine forest and the river bed below. We loved whiling away the hours on our deck where the bird watching is superb, with a multitude of different species flitting about in the surrounding trees (and there’s Wi-Fi in the tents so you can even go online if you need to consult any birding or other sites!) You’ll also no doubt enjoy the near-constant presence of the nyala delicately feeding in the shade of the forest. The public areas at Rhino Sands (also under canvas) are similarly stylish and comfortable. We loved having pre-dinner drinks flopped onto one of the comfortable period sofas in the lounge area whilst a welcoming fire crackled in the adjacent boma area. Again, the blend of traditional safari style and more modern décor touches is spot-on, making for a wonderfully comfy area to while away some time with a good book or chatting with the friendly lodge staff or fellow guests. If we had to really nit-pick, it’s a pity that the main lounge area and deck lack really clear and close-up views of the adjacent river bed, making viewing of the nyala, warthog and other assorted visitors a bit trickier than at other similar lodges. One thing that we must pick out for particular praise at Rhino Sands is the dining experience. 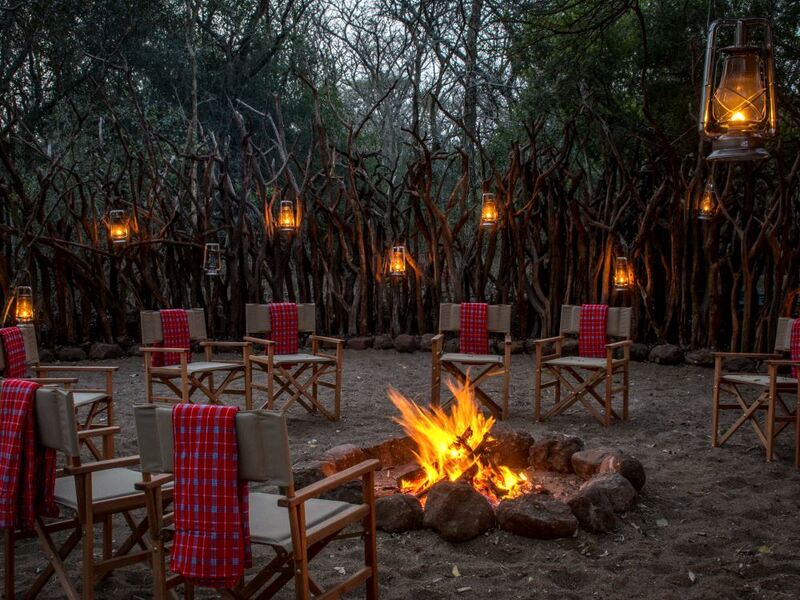 Whether eating under the stars around the boma fire, seated with fellow guests at the more formal dining table, or enjoying a romantic lamplit dinner for 2 on the privacy of your tent’s deck, the ambience we experienced was unfailingly superb and the food consistently excellent! 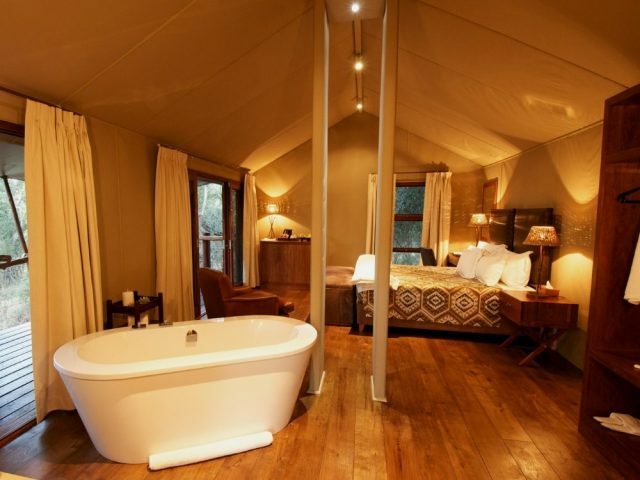 So far all we’ve touched on in this profile is the facilities within the lodge itself – but if you can drag yourself away from the undeniable comforts of the camp, then you’ll find that the game viewing experience in the Manyoni Reserve is also very good. If the name is unfamiliar you’re forgiven, with the reserve having recently being rebranded from its previous name of Zululand Rhino Reserve. Founded in 2004, the 23 000 hectares of the reserve provide good Big 5 game viewing combined with some really attractive landscapes – there are also good sightings of cheetah on offer whilst wild dog can also be spotted. The Rhino Sands team are excited that the new lodge lies within the territory of a large male leopard who will hopefully provide good sightings in the years ahead! Talking of the team at Rhino Sands, all of the main staff members have experience gained at various top game lodges and having chatted extensively to them during our visit shortly after the camp opened, it is clear that they are really enthusiastic about their new baby and determined to make it a success!